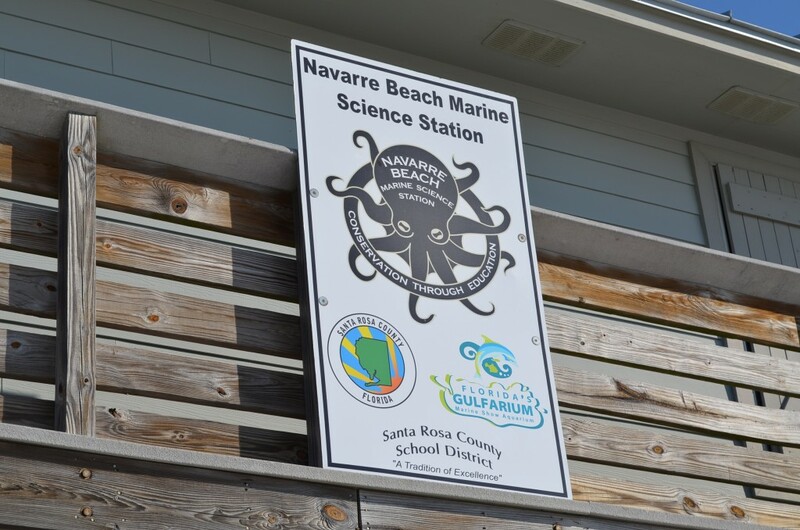 The Navarre Beach Marine Science Station started in August 2009 and is run by Santa Rosa County and the Santa Rosa County School District. 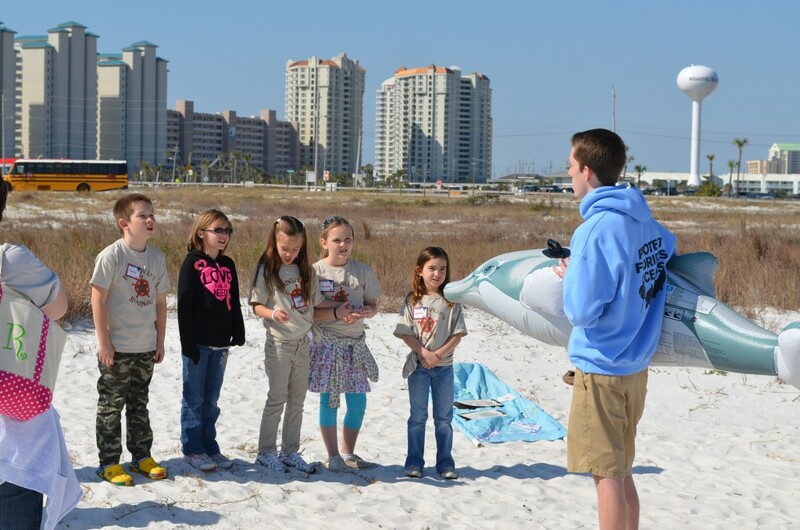 Its mission is to promote environmental awareness through education of the county’s marine ecosystem. 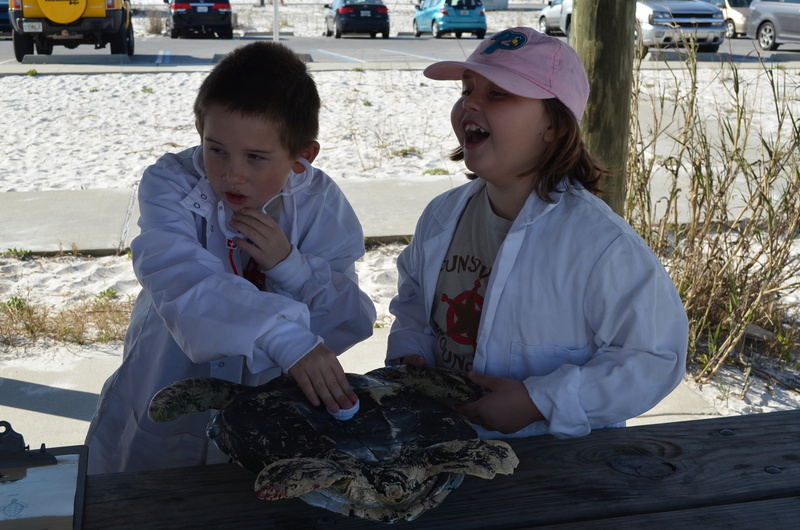 Just before the kids’ Spring Break, I had the chance to partially chaperone for Timmy’s class trip to the Navarre Beach Marine Science Station. My sons have taken field trips with their classes every school year they’ve been living here, and I suspect it’s an annual tradition for all the Santa Rosa County School District kids who live on the coast. Nostalgic note: When I was growing up in Norfolk in the 1980s, my school system also had a Marine Science Center. I’m not sure if the program still exists, but I fondly remember an annual field trip to Crossroads Elementary School, where we’d spend the day petting horseshoe crabs, learning about turtles, flounder, the Chesapeake Bay ecosystem and our community’s nautical history. 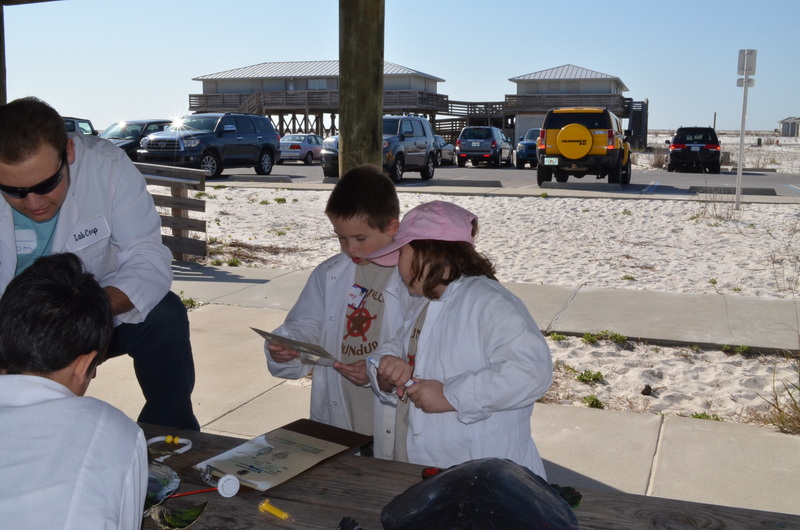 The Science Station is really close, it shares a parking lot with the Navarre Beach Park beach access that our family uses quite often, only about 10 minutes from our house. It started in 2009 after the Navarre Beach State Park property was turned over to the county after suffering extensive hurricane damage in recent years. As far as I know, there aren’t public programs at the science station. You can’t just walk right in. It’s an education/conservation center focused on working with local students. 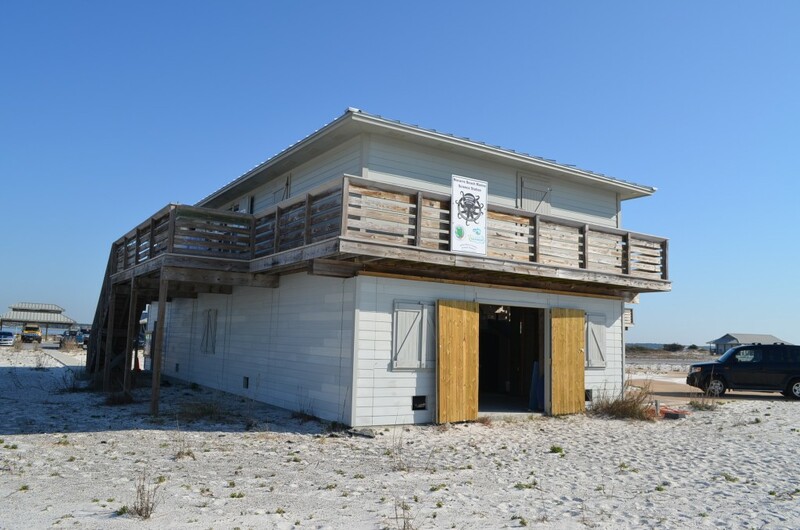 The building, a former state park ranger station, is equidistant between the Gulf and Santa Rosa Sound for easy access to both ecosystems, although the elementary school students probably spend more of their time on the Sound…it’s safer. Area high school students can register for a “dual enrollment” class in association with Pensacola State College which includes both work at the station performing research and conservation projects. The high school kids can also earn volunteer hours by helping out with the Station’s many camps. 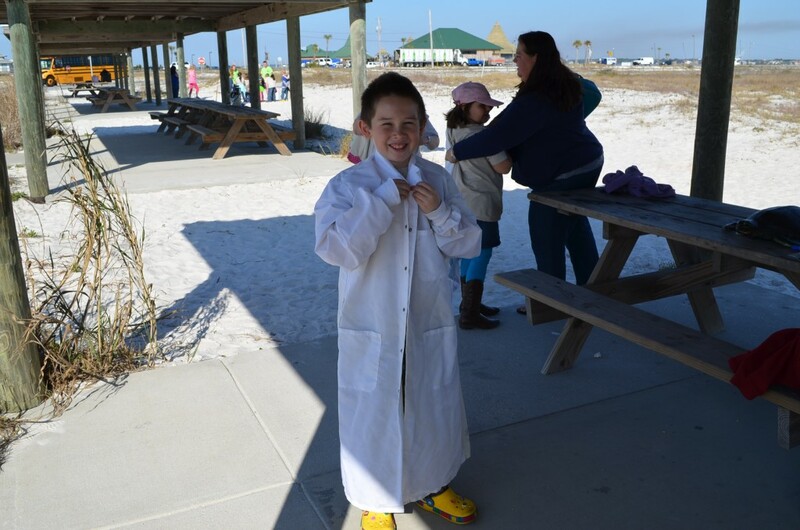 Timmy’s class joined three other 2nd grade classes from his school for a full day of marine science activities. I could only stay for the first half of his trip, but it was a lot of fun and super cute to watch. The following week, during the first three mornings of Spring Break, the boys participated in a Marine Science Camp at the Station. I had registered Jacob for the camp before this field trip, but then found out that they would accept 2nd graders so Timmy also took part. Unfortunately, many of the activities planned had to be canceled due to the cold weather last week. They were planning snorkeling and kayaking on Santa Rosa Sound. The boys still reported that they had a great time, and brought home lots of crafts. Every parent I’ve talked to whose kids have participated in any of the camps have had great things to say about it. 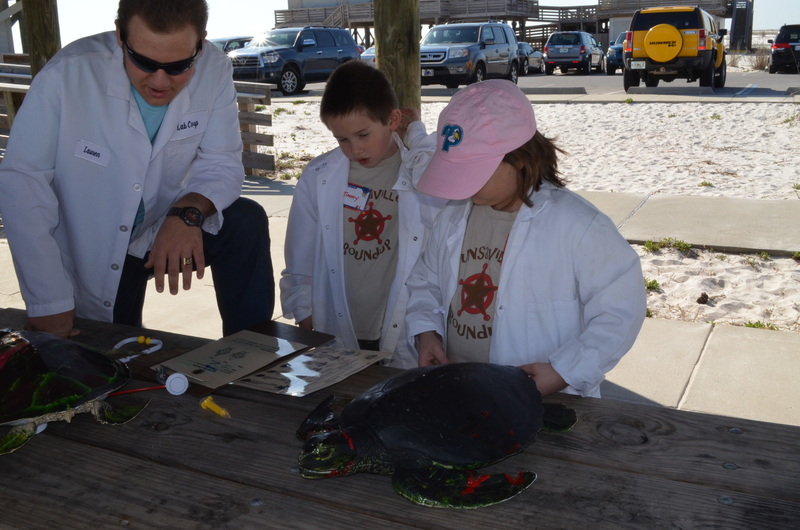 Learn more about the Navarre Beach Marine Science Station camps for grades K-8 at their website. The building is a former ranger station. There’s plenty of space inside for an assortment of projects. First things first, Timmy was to put on a lab coat and pretend to be a veterinarian. He would be working on a sea turtle. The took measurements and pretended to assess injuries. They’re studying a species guide. Each pair of kids had a different species of sea turtle. The next station was about how the Marine Science Station has the resources to mark sea turtle egg locations on the beach. This helps keep humans from disturbing the eggs. 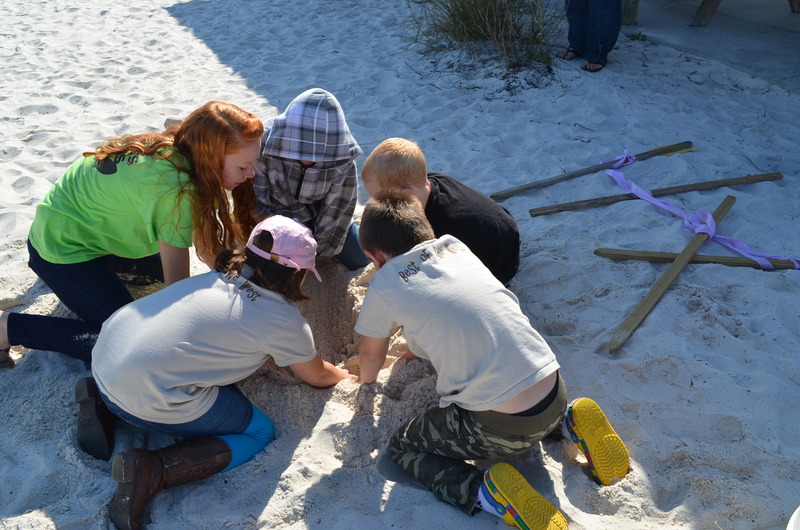 The kids learned about how a turtle nest is marked on the beach. 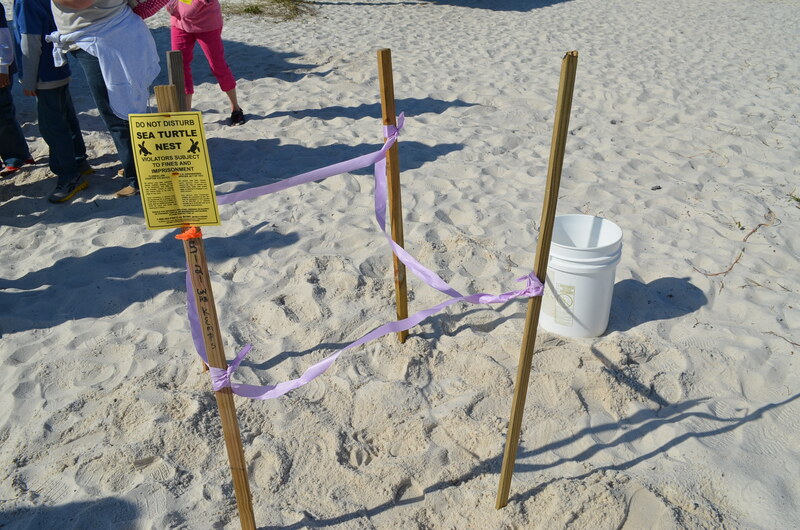 The kids learned how sometimes the turtle egg locations have to be moved to protect as many eggs as possible. They replicated moving the eggs by digging up and transplanting ping pong balls. Timmy has on the yellow shoes. The next station the kids explored was all about dolphins. They learned about the parts of a dolphin, their habits, communication skills and some of the local efforts to help injured dolphins. The high school kid is using a giant inflatable dolphin to demonstrate its anatomy. 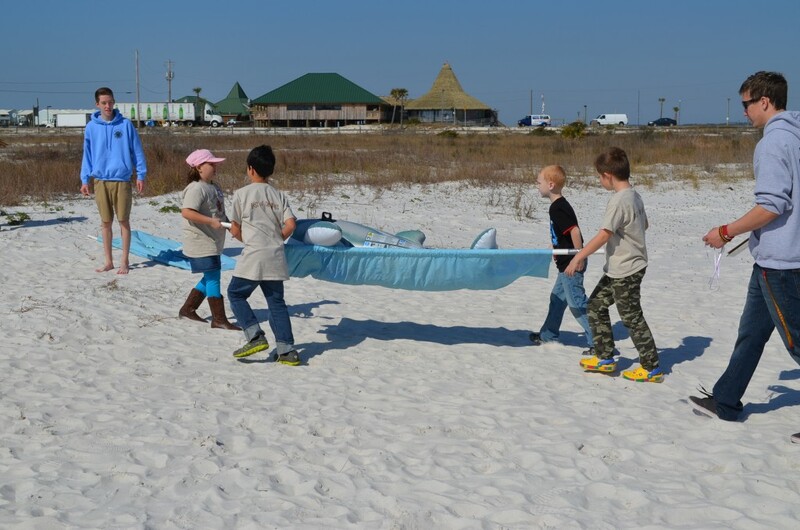 The kids learned about how you can transport dolphins on a stretcher.